Several public buildings in Galicia, northern Spain, were given new cabling for data networks, storage systems, multimedia infrastructures and training systems. Project: LAN cabling for the university clinic of Ourense and training centers of the regional government, 2015. Construction work at the University Hospital Complex of Ourense (CHIJO) was to be continued. This was to include the expansion of the IT infrastructure as well as the integration of media systems and the creation of storage and backup systems. The training centers for regional government officials were also to be modernized. 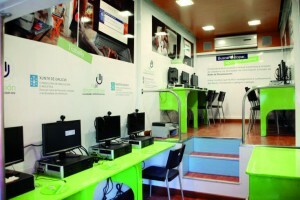 The main goal: the provision of computer equipment (digital classroom) for public schools, installations and configurations as well as adaptations to the networks in the classrooms of state schools. The focus in both projects was the development of a modular, flexible cabling solution. And the networks had to be able to be adapted to any kind of environment. “As soon as I knew the main requirements of the project, I saw R&M solutions as the answer to everything we were looking for,” says Pablo Leis, Sales Manager at Spanish network specialist EDNON. As R&M system partner, EDNON was primarily responsible for the planning of a suitable project solution. At the same time, in a separate procedure, the SERGAS (Galician Health Service) also selected R&M as a partner in its project. This saw R&M being chosen to extend the infrastructure for the IT solutions at the university clinic. This project was not just about good quality but about the provision of top-quality solutions to the citizens of Galicia – R&M made a massive contribution to this.